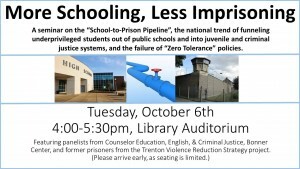 The details have been set for the Schools-to-Prison Pipeline seminar (entitled “More Schooling, Less Imprisoning”) to be held Tuesday, October 6th from 4:00-5:30pm in the Library Auditorium. Panelists will include faculty from Counselor Education, English, and Criminal Justice, former prisoners associated with our Trenton Violence Reduction Strategy project, and the Bonner Center. The seminar will focus on the role of schools as a contributor and a solution to the trend. Arrive early because seating is limited. Background: School-to-Prison Pipeline is a disturbing national trend wherein children are funneled out of public schools and into the juvenile and criminal justice systems. Many of these children have learning disabilities or histories of poverty, abuse, or neglect, and would benefit from additional educational and counseling services. Instead, they are isolated, punished, and pushed out. “Zero-tolerance” policies criminalize minor infractions of school rules. Students of color are especially vulnerable to push-out trends and the discriminatory application of discipline.